Successfully Added Media Commander - 1080P HD Networked Media Entertainment System to your Shopping Cart. The Media Commander is your command center for playing your multimedia files on your TV in mind-blowing High Definition 1080P format! 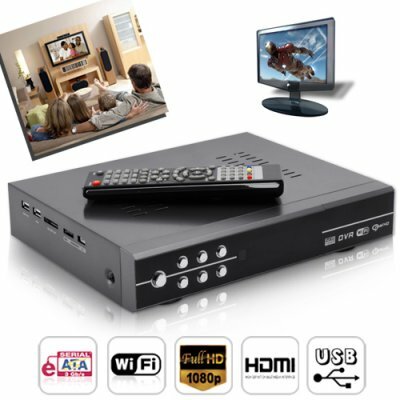 The Media Commander networked media system effortlessly connects to your HDTV to bring you true 1080p high definition screen resolution. Images appear sharper. Colors are brighter. Everything is better with The Media Commander. Output your video files to your television set using either AV Composite (red, yellow, white cables), component (blue, red, green cables), or even an HDMI connection for totally immersive entertainment experience! Great for watching the Blu-ray ripped download of Avatar or Clash of the Titans, or go back to the classics like 1080p Matrix or Lord of the Rings! But get this, The Media Commander doesn't just play HD videos, it's also a top notch music player, photo browser, and ebook reader. Imagine reading The DaVinci Code ebook on your big screen TV! ATTENTION: As a first class media player, you'll be happy to know that The Media Commander networked media system comes with complete support for the most common and most popular audio, video and image formats, including WMV, MKV, MOV, AVI. Never waste time downloading files off the Internet to find you can't play it or find the codec for it. This baby plays pretty well every media format. Take a look at the specs below for complete compatibility! You've been served! The Media Commander networked media system easily acts as a file server over your local area network (LAN) and/or Internet. Access your media from anywhere! If that doesn't convinces you to click "Add to Cart" right away perhaps this will - aside from the ability to attach hard disk drives up to 2 TB to The Media Commander, this amazing device also works as a digital video recorder for straight off the TV goodness straight to the hard drive! Simple, just open up the user manual! From changing the background to setting up network share, the Media Commander's illustrated step-by-step instructions means you'll never have to deal with customer support. Can I use the Media Commander without an internal/external hard drive? Absolutely. The internal hard drive option is just a luxury, feel free to watch all the movies on your PC directly from the Media Commander. Definitely, with support for up to a 2TB HDD, you can back up everything you want and more. The Media Commander is also small enough to carry with you wherever you go, meaning you'll be taking this thing to your office in the morning and bringing it back at night. on 2010-11-12 21:14:42 Great mediaplayer. Bought this mediaplayer few months ago and love this unit. It is fast and smooth to operate and movies are played without glitches. All files up to high bit bluray rips are beautiful to watch on big screen projection. Has enough features to give you great comfortable viewing. I am looking for some forums about this mediaplayer or is there some branded mediaplayer which is a clone of this mediaplayer, like to have more info about issues which are normally discussed about hardware on forums, like other branded mediaplayers. So if someone can provide this info, i will be greatfull. I am very satisfied with the performance of this media commander. Bought this [CVHQ-E94] Media Commander product with China vision and it is a very good hardware. Worked without any issue with the 2TB SATA HDD.